To date, I have the above three books published on Amazon and a fourth presently being written . . . 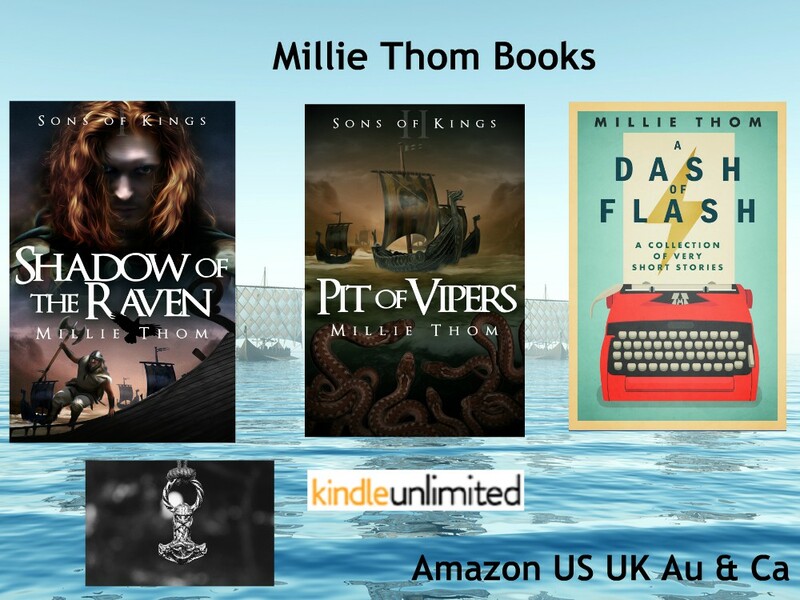 The first of these are Books One and Two of my historical fiction trilogy, Sons of Kings – a Viking/Saxon story set in the mid ninth century. There are two main protagonists throughout the books. One is King Alfred of Wessex – otherwise known as Alfred the Great – and the fictional Eadwulf, from the neighbouring kingdom of Mercia. The life of Eadwulf, young son of the Mercian king, is changed forever when his family is betrayed to the Danes by his treacherous uncle. His father is killed, his mother raped, and Eadwulf is taken to be a slave in the Danish lands. 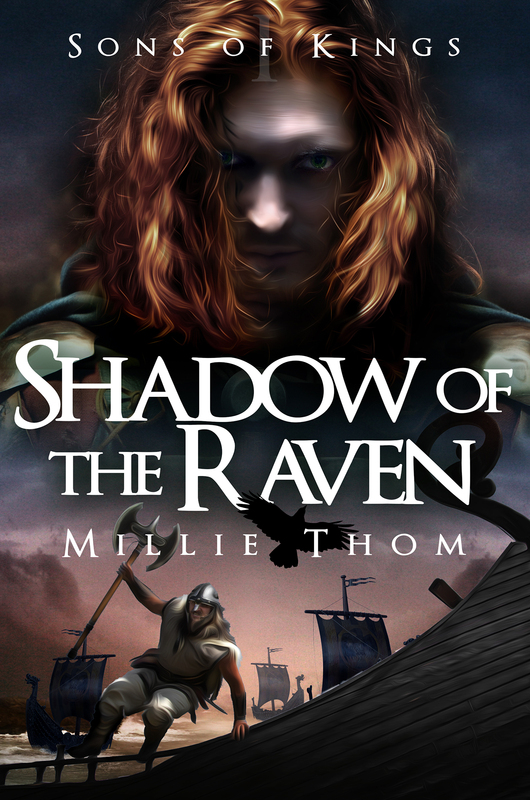 His new life is hard until the return of Bjorn, who allows Eadwulf to become a part of his closely knit crew. Eadwulf’s tale plays out against events unfolding in Wessex. Alfred, son of the Wessex king, faces family tragedies from an early age, losing first his mother, then his sister on her marriage. At the successive courts of his father and elder brothers, Alfred learns the art of kingship. And, like Eadwulf, he learns that a trusted kinsman can easily turn traitor. 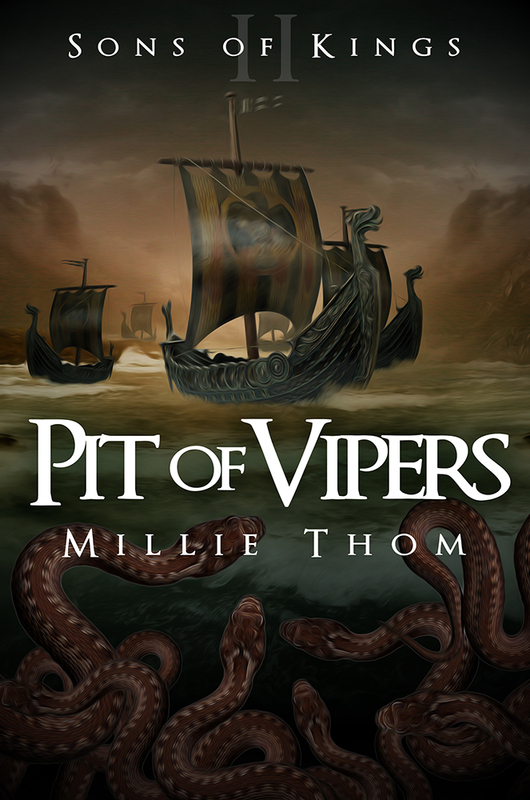 Pit of Vipers continues the story of Alfred of Wessex and Eadwulf of Mercia as the threats to their kingdoms continue to escalate. In the mid 860’s large bands overwinter again on the Isle of Thanet, breaking treaties to raid mercilessly into Kent. By now Alfred is fifteen and battling against bouts of ill health as he learns much about the art of kingship. By the following year, his last surviving brother Aethelred is king – and Alfred becomes his invaluable second in command. In this same year, the Great Heathen Army lands on the coast of the kingdom of East Anglia. By 864 Eadwulf has been back in Mercia for four years. His newfound contentment in the home of a Mercian ealdorman is marred only by his ongoing hunger for revenge on his treacherous uncle, Burgred. But as the Mercian king, Burgred proves extremely difficult to kill . 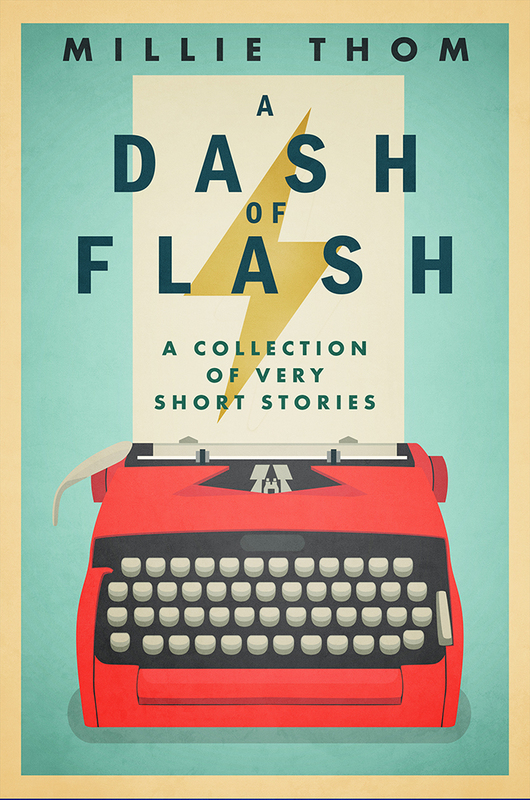 . .
A Dash of Flash is an eclectic mix of stories with both contemporary and historical settings, plus a few fairy tales and ghost stories added for good measure. Step inside and join the many and varied characters at their times of joy or sorrow, remorse or loss. Laugh at their foibles, commiserate with their grief and indulge with them as they reminisce. Or simply smile at the fantasy of the tale. All three books are available as eBooks, or in print, courtesy of CreateSpace. My ‘Work in Progress’ is Book Three of the Sons of Kings trilogy, Wyvern of Wessex. A wyvern is similar to a dragon and the title refers to the symbol on the banner of King Alfred’s kingdom of Wessex. The banner was proudly displayed at every battle. I can’t believe it’s mid-July of 2018 already! I finished writing Book 3 a while ago and it has since been edited an formatted. 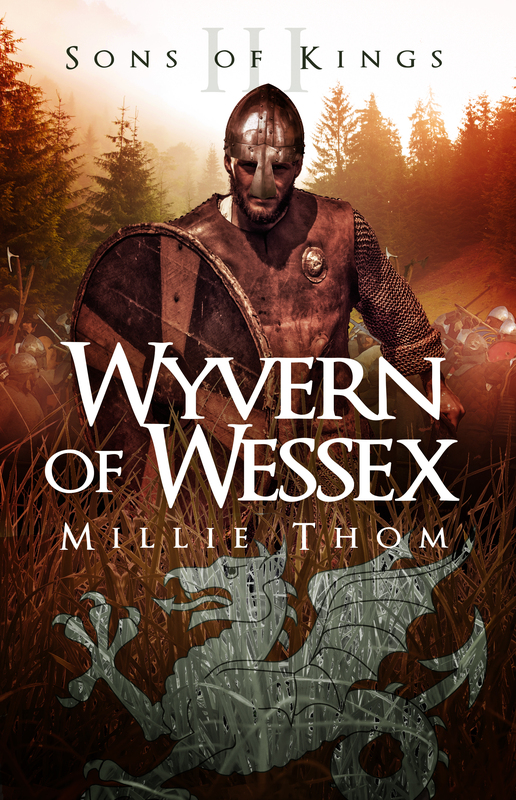 So… I’m happy to say that Wyvern of Wessex is now available on Amazon as an eBook. A print version will follow soon. In Wessex, King Aethelred is now dead, leaving his twenty-one-year-old-brother, Alfred, to succeed to the throne. Though his succession was agreed by the witan, Alfred must now prove himself worthy of the kingship, or lose it. But Wessex is in turmoil, besieged by Viking Danes intent on subjugating the kingdom – and knowing that the new king is young and inexperienced. Alfred must use all his wiles if he is to outthink and outmanoeuvre Guthrum, the Dane who very nearly becomes his nemesis. Alfred’s victories and defeats take him on a journey of learning, during which he gains experience and strength. He experiences highs and his lows, and valiantly rises from the depths of despair to save his beloved kingdom from total conquest. And, beside him at his greatest time of need is his new ally and friend, Eadwulf of Mercia. The three Sons of Kings books were intended to be a trilogy, of which Wyvern of Wessex would have been the third and last book. However, by the time I’d reached 100,000 words, I realised I was never going to finish Alfred’s and Eadwulf’s stories in that book! So I am now on the road to writing Book 4 (no title, as yet), My trilogy has now become a series! 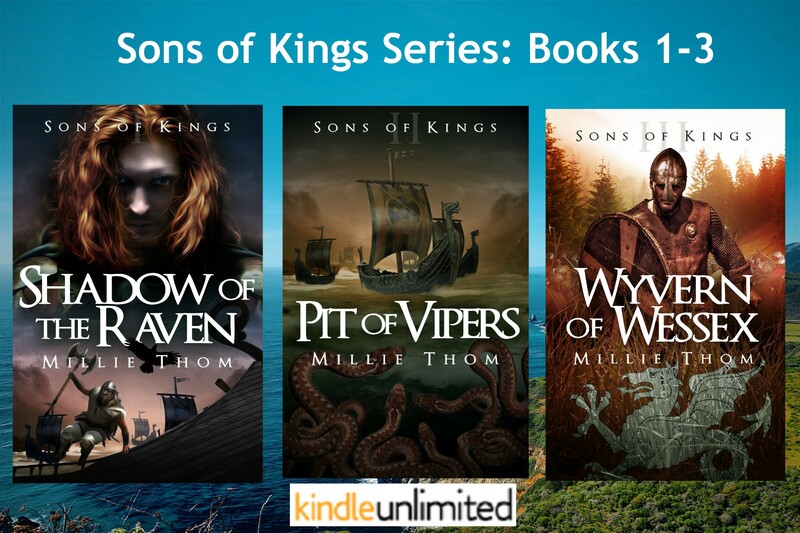 It’s now November 2018 and I’m busy writing the 4th book in the Sons of Kings series. 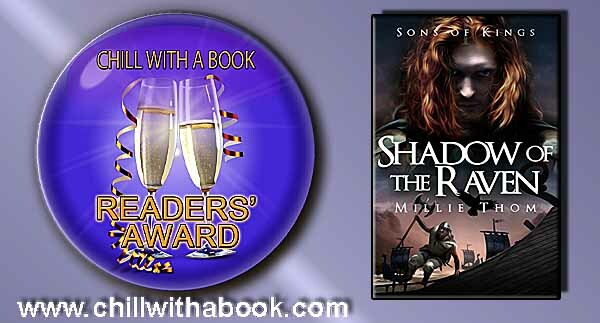 I had a lovely surprise a few days ago when I was informed that Shadow of the Raven had been awarded a Chill With A Book award. To say that I was thrilled, would be putting it lightly! That’s wonderful! I love Bernard Cornwell, too, but haven’t read his Saxon series yet, on purpose. Nor have I yet watched ‘Vikings’. I don’t want to be influenced by either until I’ve finished my trilogy. I’ve been told I have similar themes in my story to both Cornwell’s books and the TV series but I refuse to look. Similarities are inevitable, I suppose, when we’re looking at the same period and characters. I’ve read Bernard Cornwell’s Arthurian books and loved those. Oh, joy! 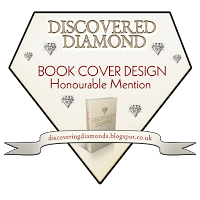 How exciting to have read your book page so soon after it was posted! 🙂 I certainly understand your not wanting to be cross-contaminated by either The Saxon Tales or the Vikings series while you are writing your trilogy. But when you are finished, you will probably want to check them both out! Ragnar Lodbrok features in a lot of Viking myths, some of them putting him in the time frame of my books, some having him later on. His death is well known, albeit a thing of myth (just like the blood eagle ritual). I suppose the mysterious, mythical side is one of the things I love about it all. I find that nothing hides my wrinkles, so my attitude now is to sport them as badges of courage and, hopefully, wisdom! Timi, you look so sophisticated with that hair style and I don’t think you look as old as me. If you are, then you disguise it well, despite what you say about rapid ageing recently. I’m sorry to hear about your past surgeries. What a lot to contend with -and so very scary. But you pulled through and I’m sure your determination not to be beaten would have played a major role in that. I’m not afraid old growing old, either. I have far too much I still want to do and so many places I want to see, to consider I might ‘pop my clogs’ in the near future. (I’m a Lancashire lass, land of cotton mills, clogs and shawls a century ago.) But, since I can do nothing about the dreaded wrinkles, I suppose I’ll just have to grin and bear them. And the new hairdo will come … quite soon. You really have inspired me to try it. Best wishes with all your books, Millie. Enjoy the day. Desperate for the third book, any idea of tough times for release yet? I intend to have Book 3 published by late spring. It’s been far too long in coming, I know, but family illnesses and other issues like house moves have taken so much of my time. I can’t find a link to find out who you are, Jonny, but I can only assume you have read and enjoyed the first two books, and thank you very much for that! Very best wishes, Millie. 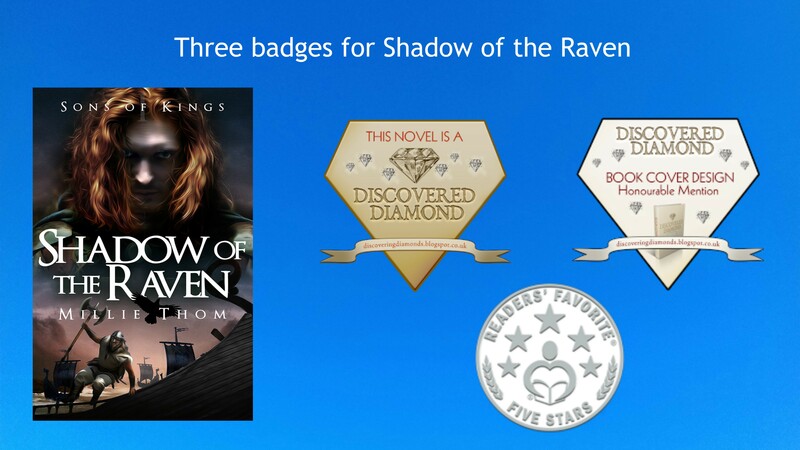 Would love to buy all 3 books in the Sons of Kings series…looks absolutely amazing….but struggling to find it in South Africa. Any recommendation hoe I can buy it would be greatly appreciated. only available through Amazon at the moment. I dropped by your website to check on your progress, and was so thrilled to see Book 3 out that I hied myself off to Amazon to grab it right away! All the best, Millie. Thanks a million for that, Christine.<3 I eventually published Book 3 at the end of last June. It was a very long time in coming, due to family health issues the previous year – during which time I wrote nothing at all. I'm hoping Book $ won't be quite that much overdue!